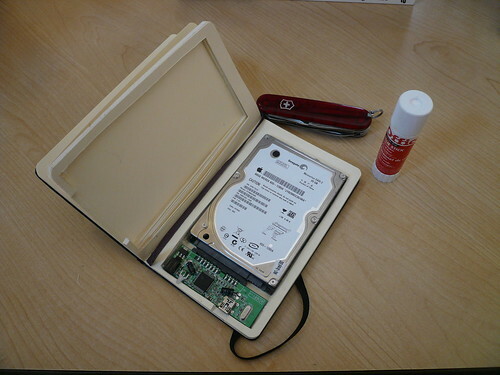 "After tracing the outline of the drive assembly, it was time to start cutting out the pages using a very sharp swiss knife. Any cutting instrument will do just fine, as long as it is very, very sharp. (Try to avoid cutting your fingers; blood stains might ruin the finish of the project. On the other hand, it might look good, so I'll leave it up to you.)" Interesting. My very first thought was heat as well. Those 3.5" drives spin more than necessary with that USB controller.